...that in the field, Elites live in polyhedral huts? ...that the Audacity was the Librarian's personal starship? 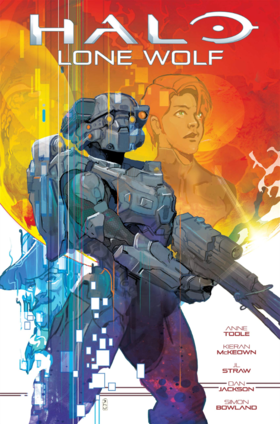 Halo: Lone Wolf is a four-issue comic mini-series produced by Dark Horse Comics that focuses on Spartan Blue Team's designated marksman, Linda-058. Lone Wolf is written by Writers Guild Award-winner Anne Toole. ↑ 2.0 2.1 Dark Horse: Linda-058's solo mission begins in "Halo: Lone Wolf"